Team Aloha: Due to the road collapse at the end of 2017 and the current flooding and devastation in April 2018, we have chosen to disable this cache. We hope to be able to reinstate it in the future should conditions make it safe to do so. Mahalo to all of those who were able to share in this cinematic adventure while it lasted! From Highway 56 turn onto Highway 580 (Kuamo'o Road) [There will be the Coco Palms Hotel (where Elvis filmed Blue Hawaii) and a kayak marina area on each corner and Wailua Beach across from 580] Continue up 580 past Opaeka'a Falls (stop if you like but might want to wait until the Roberts buses aren't there) and continue for about 7 miles until the road goes through the first stream and becomes dirt (or mud depending on recent weather) then follow your GPS! A 4X4 is required, especially if it's been raining heavily! Anything less and you should keep a local tow truck company's # handy. Use common sense and drive with Aloha - you're in "locals" territory... We HAVE seen rental cars (Mustangs, Civics, etc) back there so it is certainly possible as long as you don't drive like a lolo! There are 2 main streams that run over the road. If they are rushing, use common sense and don't go over them. See posted picture of our Jeep splashing through the stream to get an idea of what to expect under normal conditions (below). This area also gets a lot of rain which makes for a lot of pretty copper/red mud. Depending on recent conditions, you will likely encounter a 3rd wash on the gravel section of the road. USE GOOD JUDGMENT, PEOPLE HAVE GOTTEN STUCK HERE AND IT'S EXPENSIVE TO GET ASSISTED OUT! It's deeper than you think. If you have a 4x4, you *may* be able to make it if you stay away from the middle and floor it through the "puddle." Again, use your better judgment and you may even wait for others in the area to be the guinea pigs. You're a long way from a tow company if you get stuck. We've seen people taking their cars up to certain sections and then hiking the rest of the way. There is a parking area at the end of the road near the cache site. 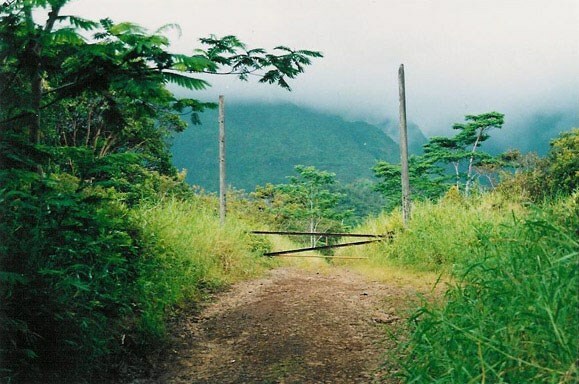 You will also see the "Jurassic Park" gate there (or what is left of it, which is 2 poles but the view is in tact). Pictures here are a must! (Please note there is a movie tour company that makes regular stops back here as well as hunters parking here. Please be stealthy as needed. Also worth mentioning is that if needing a 4X4 to do this sounds discouraging, keep in mind that you can take a car a good portion of the way and walk the rest. There is a picnic area with decent parking (right by the second stream) so you could park there and have a good hearty walk to the cache from that point on.) Good luck to everyone interested in finding it and have fun! The Jurassic Park GateThe cache is hidden just off the beaten path to the right of this picture. As you can see, the Jurassic Park gate is just up ahead from the cache. The gate itself is gone but the poles remain and you can even see an incscription from the production crew on the left concrete pole. The Gate close upThis is slightly closer to the actual gate and gives you an idea of what the view is like. Get your Jurassic Park DVD out and go to the chapter where they start the tour and you'll see why they chose this site to film the sequence. Splashing your way to the cacheThis is one of many river crosses you can splash through on your way to the cache... Please be safe though, river conditions change at any time! 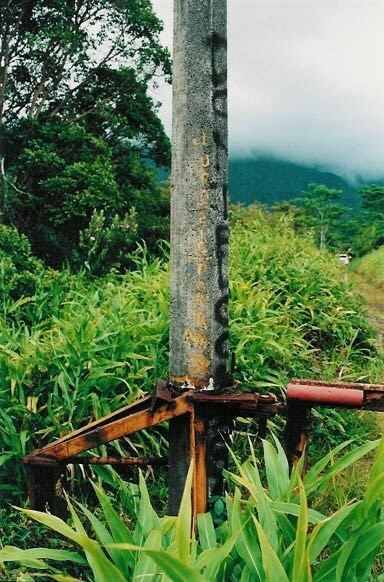 Inscription on the Jurassic Park poleThe left pole has an inscription on it that was probably put in by the workers who constructed these concrete poles that once held the gate facade used in the movie. It says Jurassic Park Apr 92.